I can feel just a little bit of crud in my throat. I'm trying to aggressively handle it, because I'm going on a fun excursion out of town this weekend. I do NOT want to be sick over the weekend, so I need to take care of it now. I didn't take the day off of work, but I might leave early and rest tonight. I'm not sick, I'm just making sure I don't get sick. Very simple. Slice one or two pears into flat slices (do more than we did for the photo...I think we took this after we ate half of the food). Lay the slices out on the tray. Then slice a wedge of Gorgonzola cheese into strips or squares. 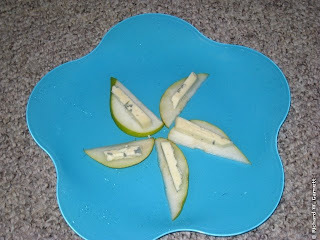 Lay one slice of Gorgonzola on each slice of pear. Presto! It's a great food combination!